A comprehensive musical repertoire for the Lenten season, from Ash Wednesday through the Fifth Sunday. 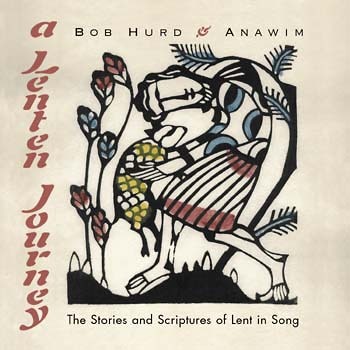 The A Lenten Journey CD offers 17 songs by Bob Hurd and Anawim for general use throughout the Lenten season, as well as settings of the seasonal psalms and songs based on the Sunday readings of the season. The choral songbook for A Lenten Journey will prepare your chorus for the holy season of Lent, adding 17 contemporary styled songs for general use throughout the season to the Lenten season repertoire. A Lenten Journey, this first collaboration of Bob Hurd and Anawim (Barbara Bridge, John Gilb, Marie Hodgson and Dominic MacAller), provides a comprehensive musical repertoire for the Lenten season, from Ash Wednesday through the Fifth Sunday. Offering 17 songs for general use throughout the season, for gathering, preparation and reconciliation, as well as settings of the seasonal psalms (for Years A, B and C), which also appear as assigned psalms on specific Sundays. The collection also contains a Communion (or preparation) song for each Sunday in all three cycles based on the Gospel and other readings. These songs highlight the shared themes and images that emerge across the three readings of each Sunday and help the assembly to a more profound "lectio divina" or prayerful hearing of the word, even as we are receiving Christ, the Word, in Communion. "The Good Shepherd," one of many highlights, is a rousing gospel number speaking of the One who "lays down his life for the sheep." A Lenten Journey is a welcome addition to the repertoire for the holy season of Lent with traditional and contemporary styling. The perfect complement to the CD includes the available choral songbook and the manuscript packet with settings for oboe and other winds.